Beautiful quality hair, could be bleached and dyed into any color as desired. Brazilian Deep Wave is a great style and in 6A quality, beautiful curls could last for a long time. Because of being made with 100% Brazilian virgin hair, the weave feels soft and bouncy, you run your fingers through the hair and will get no strands. Brazilian hair is one of the most popular hair types, the deep wave texture holds curl patterns even after being washed. The hair could be straightened easily because of its natural human hair origin. 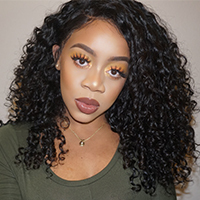 Brazilian Deep Wave Hair is suitable to every human race including African American, to add a lot volume, it is suggested to wearing 3 to 4 bundles of such weaves. Brazilian hair has a great thickness and volume, the hair is true to length and is exactly the same as decribed. Deep wave texture has a perfect curl patterns that will rightly bounce back after wet. Great hair Review by Nina L.
This hair is 100% amazing. Soft even after dying! Curls beautifully- these curls were created with rollers over night. This hair is amazingly thick too! Great Review by April M.
I ordered 3 bundles of this hair on Monday and received hair on Thursday the same week, the shipping is amazing super fast. I've been ordering hair from new star for 3 years now and never had an issue, customer services is great, the hair is beautiful and true to length, soft with no shedding, and no bad smell! I will continue to be a loyal customer. if your looking for a vendor to order hair from I would suggest new star. The seller answered all my question nicely through email, I bought 4 bundles in 16 and 18, all came in a timely manner and the hair is really soft, the curl immediately back to its pattern after I wash the hair. Leon, I have received my order, the bundles are great, I love them all, they are true to length and I want to order a lot form you, will you give me more discount?